When you are perplexed with a job of cooking a second turkey, the 18 Qt Roaster Stainless Steel Non-stick oven, model No. 4818-25-30PR comes to your help. This Nesco oven surprises you with a quick performance. The ruggedness of the oven adds to its value. Cleaning it is so easy that you are able to comfortably get rid of the meat smell after usage. If you need a buddy in your kitchen for a life time association, this sturdy oven could be the best choice. You can also cook a wide range of items by selecting suitable temperatures. The aesthetic look tempts a need of buying it. 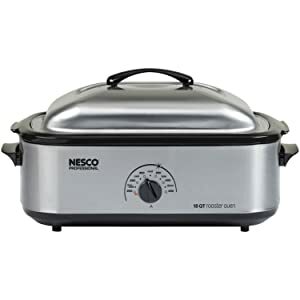 Dimensionally the 18 Qt Roaster Stainless Steel Non-stick oven measures 24x17x9 inches and weighs 17.4 pounds. The oven has an extra-large capacity of 18-quart. An extra-high dome provides more space in this oven. The attractive look of the oven is attributable to its exterior part made of stainless steel. As per the updated Circle of Heat Technology, the oven is provided with a heating element that wraps around. 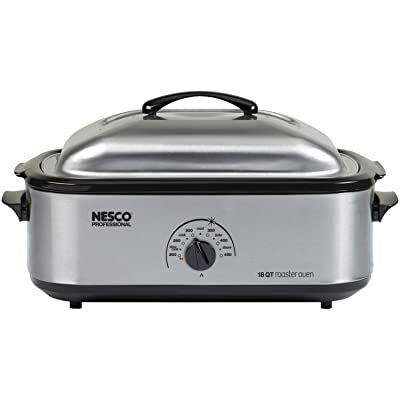 This enhances the quality of food by retaining moisture and cooking evenly. The temperature range is from 200°F to 450°F. An adjustable knob is provided against the temperature grading. The chrome plated rack is removable. The handles of the oven and lid do not get heated up. The 18 Qt Roaster Stainless Steel Non-stick oven is equipped with extra-large capacity. It accommodates 18-quart, implying 18 quarters of a gallon. If it is a primary oven in your kitchen, it is usable as a secondary oven for huge get-together events. In a single process you can cook several items. Added to this, large meat pieces can be cooked in this oven. A turkey in full can be processed. An accommodative and versatile oven! The oven is designed with Circle of Heat technology. The wrap-around heating element provides uniform heat inside the oven. This avoids over heat up of the bottom portion. Even cooking and retaining moisture are ensured. A control knob is available for adjusting temperatures between 200 450°F. This is sufficient enough to prepare different items without losing their natural qualities. The oven is handy for slow cooking and steaming with the use of temperature control. The material of the oven is stainless steel and it is non-sticky inside. Besides giving a durable performance, the oven also withstands heat up to 450°F and maintains for a long duration. As it is non-sticky, cleaning up of the oven does not involve much effort, particularly after cooking the meat items. This washing convenience is also helpful in freeing the bowl from stingy odors. You can have prolonged use of the oven with confidence. It has 18-quart extra-large capacity to prepare large meals and huge meats. Elaborate usage in cooking – from steaming to slow cooking. The Circle of Heat Technology the wrap around heating element provides even heat inside. Stainless steel, non-sticky – promising durability and easy clean up. The lid is not robust. The lid, however, is function oriented and its heaviness can add to weight only. This is avoidable if empty oven is not heated up. Many customers using the 18 Qt Roaster Stainless Steel Non-stick oven recommend this product for others and this stands for its credibility. The oven is spacious enough, versatile, efficient, easy to clean and above all, durable with its rugged stainless steel structure. The modern technology of heating known as Circle of Heat Technology adds feather to its cap. Handling the oven is safe as it has cool-touch handles, not sparing the lid even. Sticking to this non-stick oven could fetch exceptional advantages to your kitchen.